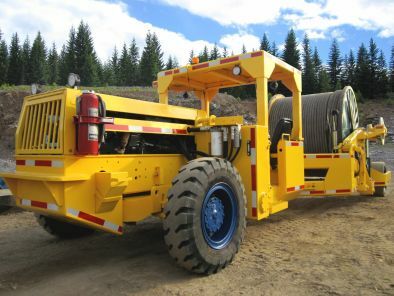 Certified Mining and Construction Sales and Rentals now has a Mobile Reel Handler for rent or sale. The unit can be custom built for unique operations in mines or surface construction sites. The motorized reel handler can be used in underground or surface applications for the purpose of transporting reels around site. This Mobile Reel Handler can be used for reel transport and as a means to pay out / unwind line. The Working Load Limit of the reel unwinder is 41,000 lbs, the maximum reel width is 104” and maximum reel height is 116”. The Mobile Reel Handler is designed to be partially disassembled so that it will fit down most mineshafts with ease.